As the 2016 election enters its final days, there are substantial differences in the level of respect voters think Hillary Clinton and Donald Trump have for different groups in American society, and some of the widest gaps are on women, blacks and Hispanics. About three-quarters of registered voters (76%) say Clinton has a great deal or fair amount of respect for women, while just half as many (38%) say this about Trump, according to a Pew Research Center survey conducted Oct. 20-25. A majority of voters (60%) say Trump has little or no respect for women, including 36% who say he has no respect at all for women. Roughly equal shares of women (62%) and men (58%) say Trump has little or no respect for women, but women are far more likely to say he has no respect at all: 43% say this, compared with 29% of men. There are no significant gender differences in perceptions of Clinton’s respect for women. Both Clinton and Trump are seen by majorities of voters as having a great deal or fair amount of respect for men, but larger shares say this about Trump (82% for Trump, 65% for Clinton). While Clinton’s supporters – men and women alike – overwhelmingly say Trump has little or no respect for women (94% say this), it is Clinton’s female supporters who are most likely to say Trump is completely lacking in respect for women. 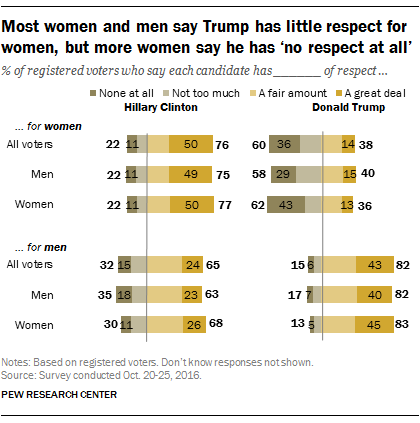 Two-thirds (67%) of women who back Clinton say Trump has no respect at all for women, compared with a smaller majority (56%) among men who back her. Trump supporters (both men and women) are evenly split over whether Clinton is respectful of women: 49% say she has a great deal or fair amount of respect for women, while the same share (49%) says she has little or no respect for women. Among Trump voters, both men and women largely say that Trump has a great deal or fair amount of respect for women (82% each). However, nearly all Clinton supporters (98%) say she has a great deal or fair amount of respect for women. Aside from women and men, the survey finds that Clinton is seen as much more respectful of Muslims, immigrants, Hispanics and blacks. Among 12 groups asked about in the survey, Trump only rates higher in his respect for men, evangelical Christians and white people, though half or more voters also say Clinton has at least a fair amount of respect for these groups. Overall, large shares of voters say both Clinton and Trump have a great deal or fair amount of respect for white people (83% say this about Trump, 77% Clinton). While two-thirds of voters say Clinton has at least a fair amount of respect for black people, just 42% say the same about Trump. Voters have similar views of the candidates’ respect for Hispanic people: 66% say Clinton has a great deal or fair amount of respect for Hispanics compared with 35% who take the same view of Trump. The overall gap in voters’ views of Trump and Clinton’s respect for nonwhites is even more pronounced among minority groups. While 86% of black voters say Clinton has a great deal or fair amount of respect for black people, about as many (89%) say Trump has little or no respect for black people – including nearly six-in-ten (59%) who say he has no respect at all for blacks. The pattern is similar among Hispanic voters. Nearly eight-in-ten (79%) say Clinton has a great deal or fair amount of respect for Hispanics. By comparison, 71% say Trump has not too much or no respect for Hispanics, and 54% say he has no respect at all. The same survey finds that Clinton supporters are more likely than Trump backers to say they have a hard time respecting people who support the opposing candidate. To some extent, this may reflect the widespread belief among Clinton supporters that Trump does not respect either “people like you” or other groups. For example, nearly three-quarters of Clinton’s supporters (72%) think that Trump has little or no respect for women, blacks, Hispanics and “people like you.” By comparison, just 40% of Trump supporters say Clinton has little or no respect for all four of these groups. Correction: The original headline for this post misstated the degree of respect perceived by majorities of men and women. It was corrected June 29, 2017.